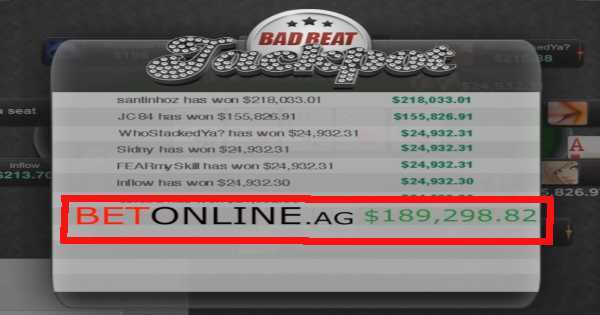 On Sun., Nov. 11, 2018, the Bad Beat Jackpot at BetOnline and the other Chico Poker Network sites (Sportsbetting.ag and TigerGaming) was hit at the value of $1,249,972. The biggest share of the pot went to “santinhoz,” who picked up a prize of $218,033.01 when his quad tens were cracked by quad aces. This beats the previous largest Chico BBJ activation, from January 2018, which was “only” $990K+. The action unfolded at a nine-handed $1/$2 No Limit Texas Hold'em Bad Beat Jackpot table. “santinhoz” opened the pot for a min-raise of $4 under the gun. The next player, “FEARmySkill,” cold-called, and then the action folded around to “JC84” in the small blind. He bumped it up to $8, and both remaining players called. Going into the flop, the pot was $26. The community cards came down: A♠ T♦ T♣. Despite the fact that this board looks like a favorite to have connected with any number of holdings in preflop raising and three-betting ranges, all the players checked it through. The turn was the 2♦ . “JC84” led out for $18.04, and “santinhoz” called. “FEARmySkill” got out of the way of the two remaining competitors. The quad tens of “santinhoz,” normally a lock to take down any pot, were inferior to the quad bullets of “JC84.” This otherwise frustrating result of having a near-unbeatable monster cracked, though, set off the Bad Beat Jackpot, which stood at a total of $1,249,972. As the loser (but not really) of the hand, “santinhoz” scored 17.5% of the jackpot, or $218,033.31. His opponent at showdown, “JC84,” received the next-largest share, 12.5%, which worked out to $155,826.91. Another 10% of the pool went to the remaining players dealt into the hand, who got around $24,932 each. You may have noticed the two names at the bottom of the list who didn't make anything from the hand. No, they weren't mere observers at the table, nor were they disqualified for any shady behavior. What happened to these two unfortunate souls was that they were present at the table during the fateful hand, but they were sitting out and thus, did not receive any cards. Only those who are actually dealt into the hand qualify for a share of the prizes. We imagine “Snapcase10” and “Rightplay” are cursing their luck even as we speak. Everyone else sitting at any other Bad Beat Jackpot table at the time the triggering combination was struck – 50 users total – also received a share of 10% of the prize pool. $124,661.53 was allocated in this manner with every participant receiving a single share of $2,493.23 regardless of the number of total seats he or she occupied in different BBJ tables. 35% of the pot was carried over to start the new Bad Beat Jackpot prize pool: $437,490.20. It's rather unusual for the same person to win a BBJ at a site twice in a row, so this news might cause some observers to look askance at the poker room. Still, the player volume numbers at the Chico Poker Network are smaller than at a lot of other sites, so this isn't exactly a coincidence of getting-struck-by-lightning-twice proportions. However, the fact that the site's Bad Beat Jackpot promotional webpage makes no mention of the second jackpot win, the BetOnline YouTube channel didn't release a video about it, and the BoL Twitter feed is silent on the topic makes it appear as though the site has something to hide. The Bad Beat Jackpot is active at clearly marked tables on the Chico Poker Network. They only exist at No Limit Hold'em blind levels of $0.50/$1.00 and higher. It's possible to easily identify BBJ tables because they have a star next to them in the lobby. The BBJ is funded through a special drop taken at participating tables. It amounts to $0.10 for every $4 in the pot, which is an extra 2.5% rake, but it's capped at a maximum of $0.50 per hand. In order for the Bad Beat Jackpot to pay out, a hand of a minimum specified strength must go to showdown and lose. In the past, the qualifying losing hand has been set as high as quad jacks, but it has been lowered and is quad eights at present. The network adjusts this minimum hand strength based upon the size of the jackpot and the length of time since it was last hit. Only hands where at least four players were dealt hole cards are eligible to trigger the BBJ. In addition, both the winning and losing hands at showdown must use both hole cards to compose their final five-card poker hands. As lucrative as the Bad Beat Jackpot was for winner “santinhoz,” it was almost as remunerative for another participant. We're not talking about an individual at the table – no, we're referring to the Chico Poker Network itself. You see, the organization managing the Bad Beat Jackpot extracted 15% as “administrative fees,” which amounted to approximately $189,298.82. It gets worse. Chico quietly and sneakily altered this hold percentage while the jackpot funds were accumulating. The new structure of the Bad Beat Jackpot increased the amount kept by the house by 2.5% of the total. In the jackpot that was recently won, this corresponds to roughly an extra $30K for the network. We would have no problem with this (well, apart from it being a bit on the high side) if the change was made after the promotion paid out and before the new jackpot pool got truly going again. But to fiddle with the payout chart after months of rake had been paid into the pool seems a bit underhanded to say the least. Not only that, but a close examination of the numbers reveals that the amount kept back to reseed the pot has increased from 30% to 35%. This further dilutes the value of the promotion, at least for those who help to increase the prize pool by playing regularly, because it has the effect of catapulting money into the future. That is, people are paying extra BBJ rake today for the benefit of those who will be seated at the appropriate tables far into the future. 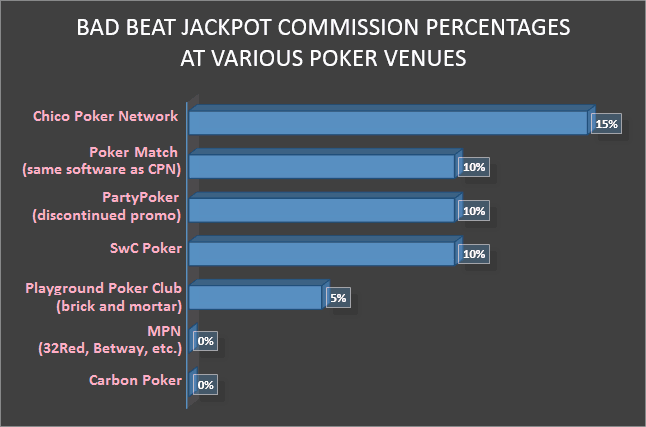 One possible reason for this is that the Chico Poker Network wants to keep the jackpot total high. In the past, it has had to kick in its own money to top off the Bad Beat Jackpot after it was hit twice in rapid succession. Increasing the percentage that goes to fund the new kitty makes this scenario much less likely to occur going forward. Notwithstanding its shenanigans involving the Bad Beat Jackpot, the Chico Poker Network remains an excellent place to play some cards. Crossover traffic from the attached sportsbook and casino leads to quite profitable games. You can simply elect to avoid the BBJ tables if you don't feel like paying the extra drop. Our preferred Chico Network partner is Sportsbetting.ag. It welcomes new poker players with a 100% up to $1,000 bonus, worth 20% rakeback. 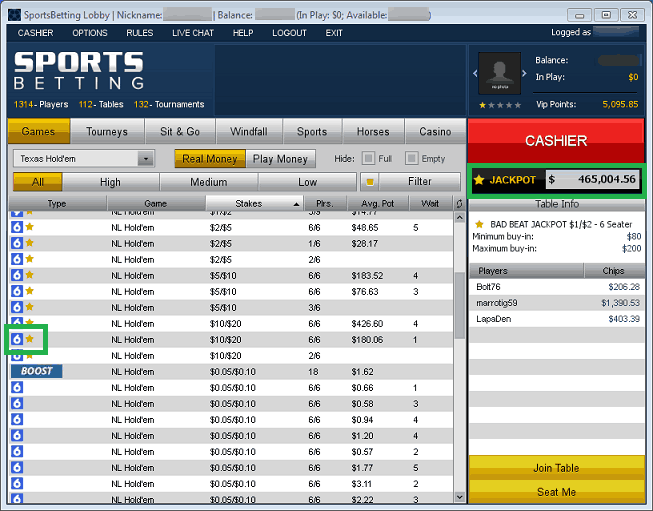 Read our detailed Sportsbetting Poker review for further info, including signup instructions. Another alternative for American players is BetOnline, which you can learn about in our BetOnline review. Finally, there's a third Chico skin that's only open to international customers, not residents of the United States, and you can find out what it has to offer in our TigerGaming Poker review page. To explore your other options for offshore poker sites, check out our USA poker guide. If you don't reside in the United States, then consult our Australian online poker page or our overview of the Canadian internet poker scene for info that pertains to your country.